Paddling for strength is pretty much how our foundation started. 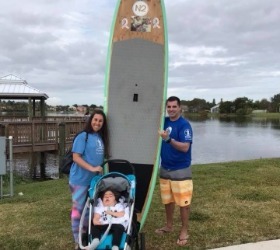 After my Luke was born, and I retire from Ironman racing, I decided to paddleboard from west palm beach to key west to raise awareness for Nemaline Myopathy. 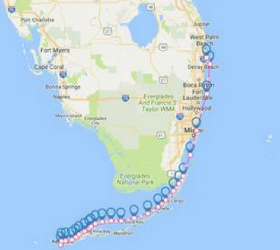 That is a 200 mile paddleboarding trip. The plan was to do it in February 2017, however we did not get enough funds, and the project was postponed to summer of 2020 (hopefully). On January 2017 I still did a 24 hours paddleboard in the lake. 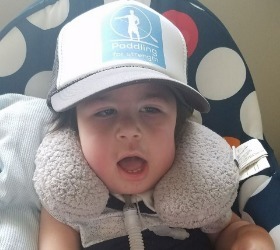 Paddle boarding requires full body strength and balance, and this is one of the greatest physical challenges for Luke. It requires a lot of core, and Rich says that strength comes from the core, making this the perfect sport. Rich and Luke are from the horoscope sign Cancer – energized by water. Rich is a former pro Ironman triathlete and wanted to do something different than swim/bike/run to challenge him and at the same time require more strength. Dedication, Inspiration, Motivation, Love, Purpose. Donate below to this project.